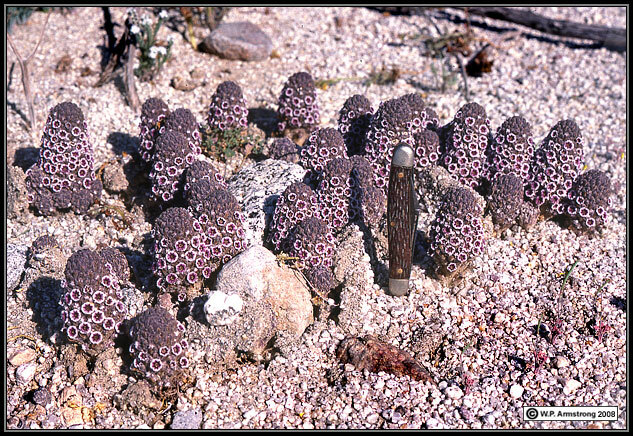 One of the most interesting of all dune plants, and certainly one of the most bizarre wildflowers in North America is "sand food" (Pholisma sonorae). 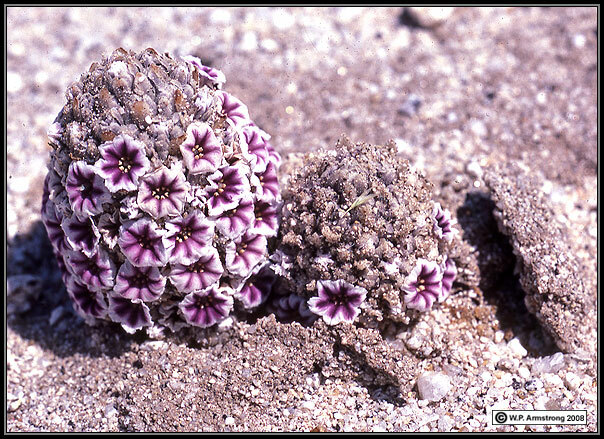 This amazing parasitic flowering plant grows in the Algodones Dunes of southeastern California and adjacent Arizona, and in the sand dunes of El Gran Desierto in Sonora, Mexico (north of Bahia Adair in the Gulf of California). 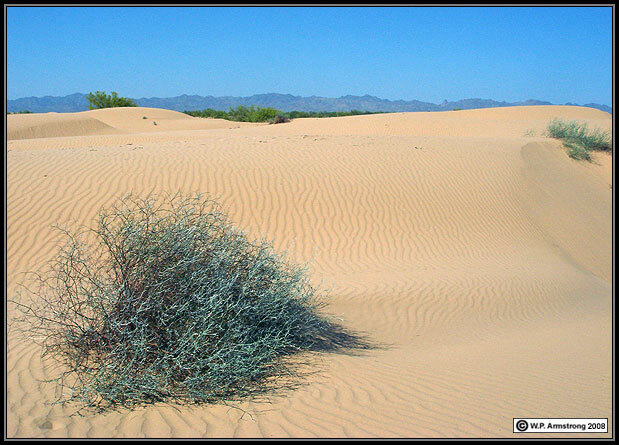 Within this area, the plants grow on sand dunes produced by wind transport of sand from the beaches of ancient Lake Cahuilla and the Colorado River delta. Another unusual species of sand food (Pholisma culiacana) is endemic to rocky, subtropical thorn scrub 500 miles (800 km) south in Sinaloa, Mexico. The disjunct distribution of these two species may be explained by plate tectonics. Floras west of the San Andreas fault and Gulf rift, in southern California and Baja California, have been displaced northward at least 500 km since the Miocene epoch (about 30 million years ago). Assuming that P. culiacana is more like the tropical progenitor of both species, P. sonorae could have diverged into a more xeric (drought resistant) species west of the San Andreas fault as peninsular California moved northward. 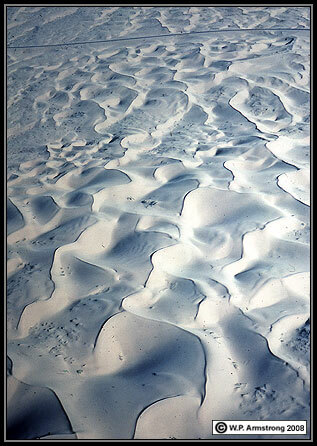 Present day populations of P. sonorae east of the fault could have migrated there by shifting sand dunes in the region. 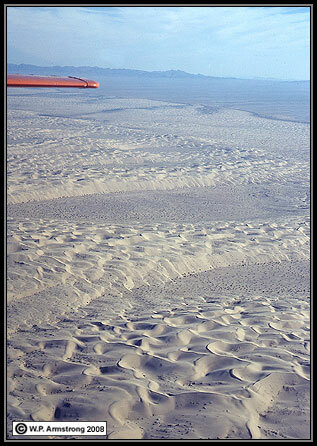 Aerial view of the Algodones Dunes near Glamis, California showing Highway 78. This belt of sand dunes extends southeasterly for more than 40 miles across the southwestern corner of Arizona and into Sonora, Mexico. 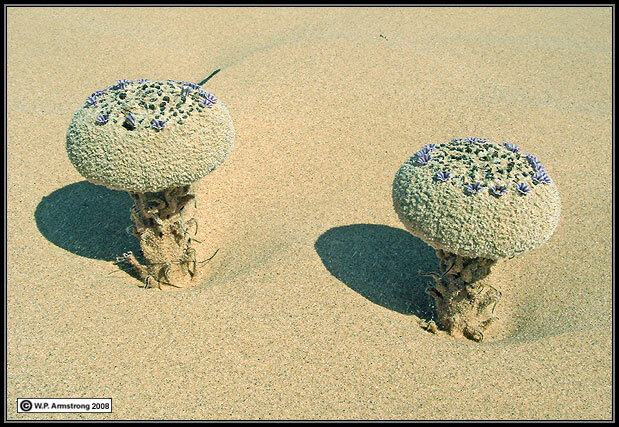 Left: Several mushroom-like flower heads of sand food on the surface of a dune. 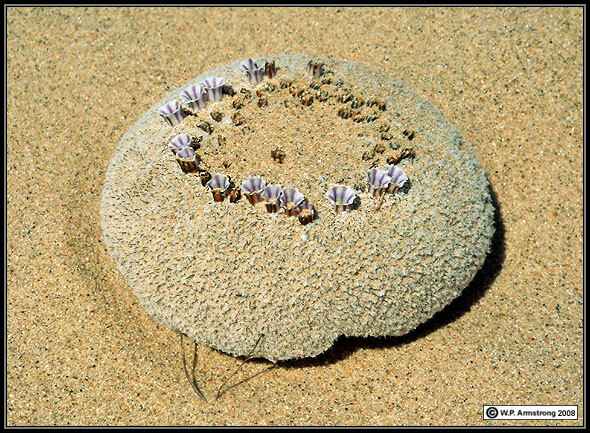 Each head arises from a thick, scaly stem that may extend 6 feet (2 m) or more into the dune where it attaches to the roots of nearby shrubs deep in the soft sand. 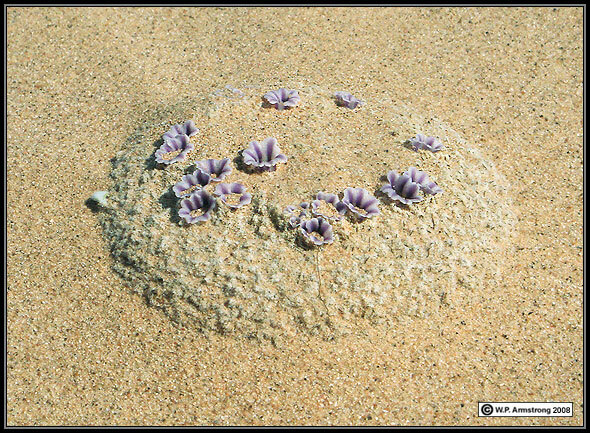 The entire plant is a root parasite that lives below the surface of the sand, with only the flower head pushing above sand during early spring. 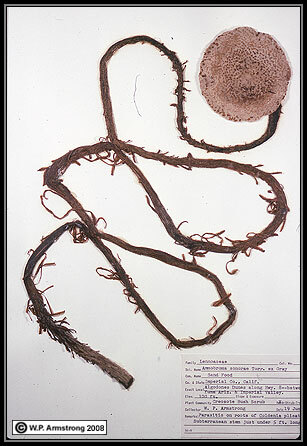 Right: Dried herbarium specimen of flower head with a long, subterranean scaly stem. It superficially resembles a sand dollar attached to a long piece of seaweed. 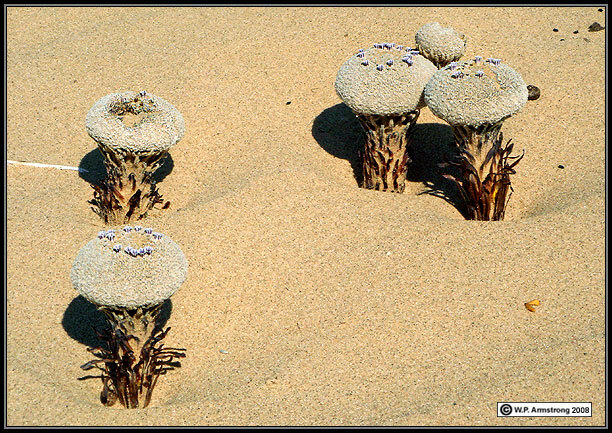 Several mushroom-like flower heads of sand food (Pholisma sonorae) on the Algodones Dunes. Each fuzzy head produces numerous tiny lavender flowers. Sometimes the heads are partially covered by the shifting sand. Left Image: Junction of sand food stems with root of Eriogonum deserticola. A. 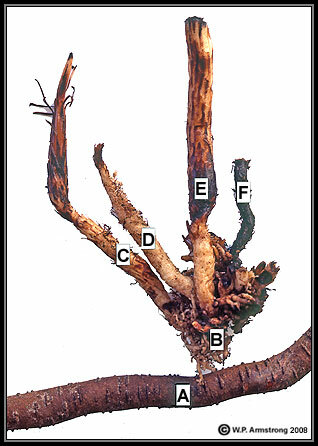 Large, woody host root. B. Fleshy haustorial mass with numerous haustorial roots. C. Scaly sand food stem arising from haustorial mass. D. Old sand food stem from previous flowering season. 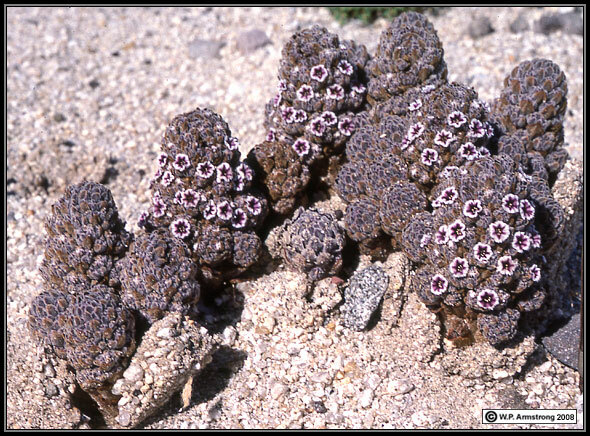 Right Image: Clump of sand food stems and haustorial mass removed from large root of Eriogonum deserticola. A. Large host root. B. Network of haustorial roots and fleshy mass. 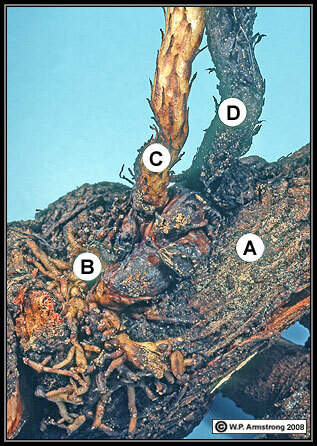 C, D and E. Leafy stems arising from basal haustorial mass. F. Dried sand food stem from previous flowering season. 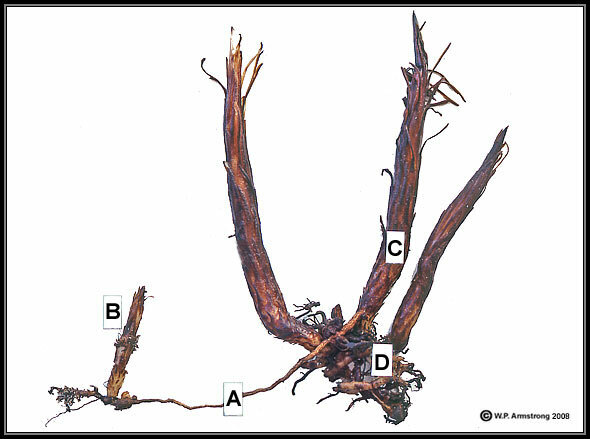 Sand food stems arise from a perennial haustorial connection with lateral roots of the host shrub Eriogonum deserticola: A. Small host root with a young, developing sand food. B and C. Leafy, fleshy sand food stems. D. Haustorial connection with larger host roots. Dune buckwheat (Eriogonum deserticola), endemic to the Algodones Dunes and one of the host shrubs for sand food (Pholisma sonorae). 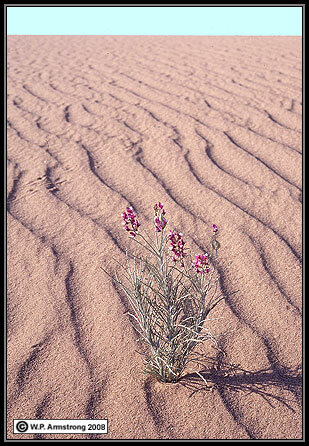 Left: Dune locoweed (Astragalus magdalenae var. peirsonii), endemic to the Algodones Dunes. 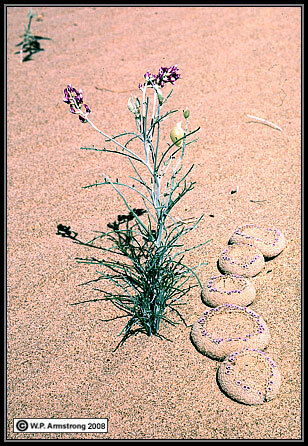 Right: Dune locoweed and sand food (Pholisma sonorae). 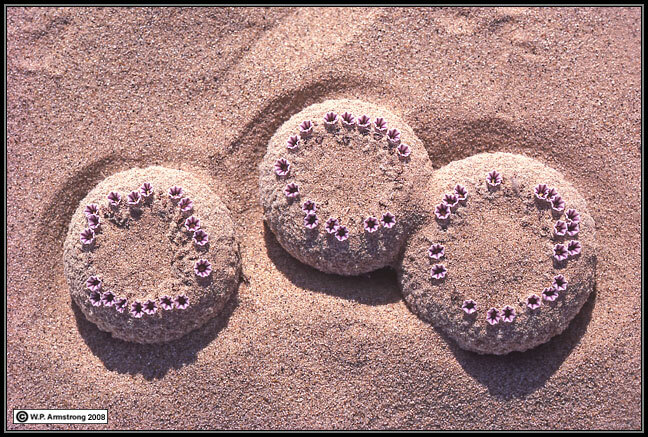 Sand plant (Pholisma arenarium), a close relative of sand food (P. sonorae) that is occasionally seen in sandy areas of the Colorado Desert region. Like sand food, it is parasitic on the roots of nearby shrubs. 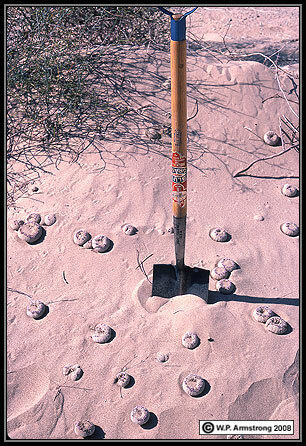 Unlike sand food, it typically prefers sandy riverbeds and washes rather than sand dunes.